The final competition of the Shanghai Longines Global Champions Tour saw a familiar face on the winner’s step, as 2017 Champion Harrie Smolders (NED) rounded out the weekend with a win in the Massimo Dutti Trophy. Lightning fast as ever, the flying Dutchman made a formidable return to the Championship, beating Britain’s Ben Maher (GBR) with Madame X and Maurice Tebbel (GER) with Chaccos’ Son who took second and third respectively. Less than a second split the top three, with an edge-of-the-seat finish for the passionate and enthusiastic crowd. A smiling Smolders said: “I’m very pleased with Monaco. Its the first time he’s [competed] at a GCT, so to win is fantastic. It’s the first time I really went fast with him. He’s a good prospect [for the future], I have a good feeling, and he felt ready to do it today." The final day of competition welcomed back crowds of spectators, who filled all three grandstands to witness the world’s best compete under clear blue skies. Italian designer Uliano Vezzani put together another brilliant course, technical enough to test the best riders in the world; a big treble requiring scope and power in equal measure and related distances kept the fences coming fast. The final line, set against the bustling grandstand took concentration, caused the most trouble, and two gappy blue and white Longines planks picked off a few of the top contenders heading into the final class. First to go clear was Karel Cox (BEL) with Dublin van Overis, the Belgian rider looking to be on strong form this weekend in Shanghai. Cameron Hanley (IRL) and Eis Isaura were quick to follow, meaning there would be a jump-off; but it would be a tough one to join. Poles fell all around the arena, with shock exits from Kevin Staut (FRA) on Just Energie, John Whitaker (GBR) on Cassinis Chaplin and the last class winner Constant van Paesschen (BEL) with Jilbert van’t Ruytershof - all collecting faults in different places on the testing course. Alberto Zorzi (ITA) put in a brilliant round with top mare Fairlight van t’Heike, the pair leaping and dancing around the arena, making the tough course look deceptively easy. To follow was yesterday’s Longines Global Champions Tour Grand Prix of Shanghai winner Gregory Wathelet (BEL) who brought out stallion Eldorado van het Vijverhof for the final class of the weekend, hoping to do the double. But it wasn’t to be, with the pair retiring after poles began to roll. Ben Maher (GBR) appeared in phenomenal form all event, putting in another brilliant clear, this time with bay mare Madame X and paving his way to the jump-off. He would be joined by Pius Schwizer (SUI) with About A Dream, Maurice Tebbel (GER) with Chaccos’ Son, Lorenzo de Luca (ITA) with Jeunesse van T'Paradijs, Harrie Smolders (NED) with Monaco, Jos Verlooy (BEL) with Japatero VDM, Michael Whitaker (GBR) with Valmy de la Lande and a thrilled Cindy van der Straten (BEL) who put in an exceptional round with Catalina. So it would be an 11 rider jump-off, promising an explosive final class of an incredible weekend of top sport. First to go was Karel Cox (BEL) with his blazing chestnut horse Dublin van Overis. Setting off at a gallop the pair took a risk too many at the tight roll back, with the Longines rail toppling. Pushing to better their time, they took another pole, finishing the jump-off on 8, with the rest of the field to follow. Cameron Hanley (IRL) soon set the pace to beat, with a blistering round on Eis Isaura, flying to the last in 41.93s as the crowd roared in appreciation. Alberto Zorzi (ITA) and Fairlight van t’Heike were not as quick over the ground, but the Italian pulled off some jaw-dropping turns to shave off time, slotting in just behind in 42.44s. Speed merchant Ben Maher (GBR) shifted the gears up a level, hoping for another podium position to complete his hat-trick this weekend. The crowd gasped as he gave Madame X her head to the last, flying through the finish gates in 40.47s, and raising the temperature in an intense jump-off. Puis Schwizer (SUI) just wasn’t quite quick enough to topple Maher’s time, and neither was young rider Jos Verlooy (BEL) who had one down coming out of the combination. Harrie Smolders (NED) had a look of pure determination on his face as he looked over the course. The 2017 Champion put in a class turn to the roll back, taking out strides to the oxer and powered around the arena with Monaco to slip in front with a time of 40.33s. Always a danger in the jump-off, Lorenzo de Luca (ITA) and Japatero VDM pulled out all the stops, but had to settle with a time of 41.40s, slipping behind Maher. Cindy van der Straten (BEL) opted for a clear with Catalina, but the duo ran into trouble at the double and clipped the final fence to rule them out of contention. All eyes turned to Michael Whitaker (GBR) with his impressive grey Valmy de la Lande as they cantered into the arena, laser-like focus as the jumps came thick and fast. Groans erupted as the penultimate fence fell, leaving just one rider between Smolders and victory. The final challenger was Maurice Tebbel (GER) with Chaccos’ Son, who put in a lightning fast round. The crowd held their breath as they flew to the last, but they finished just shy of Smolders’ time, taking third in 40.92s. And so ends a supreme weekend of top sport, with the 5th edition of the Shanghai Longines Global Champions Tour coming to a close. 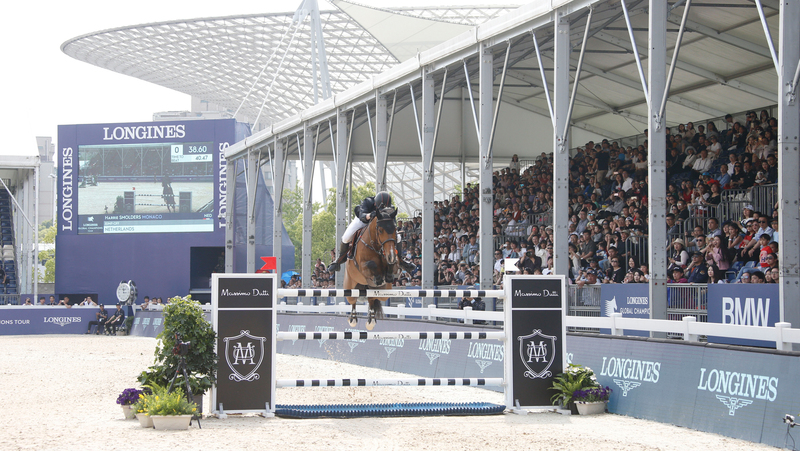 With the overall Championship battle picking up pace, the Tour now looks to Madrid, Spain, for round four of the action, as the world’s best horses and riders descend on Europe in just two weeks.